See the "more... / ACTIVITIES" TAB above, to view photos of past Dragonfly events. The annual Dragonfly event is a 3 day, 2 night event, with limited crash "Sleeping" space for up to 9 people average in the house. NOTE the party and sleeping area is the same room for those thinking on bringing children. Reservations for Friday food and In door crash space will be closed off no later than Sunday June 30th. There is also additional but limited Small tent camping space on event site as well, on a First come first serve basis. 1) All activities at the event site for saturday is coordinated, planned and ran / controlled by the local motorcycle club. 2) The event is held by them in order to help them raise funds for their group. 3) Gymnitai receives no incentives, items, nor favors for any of our participation with their event. 4) Gymnitai nor any of its members make any profit from any of the activities planned around same said activities or event. We simply coordinate our annual dragonfly Hangar citizen event the same weekend to make more entertainment and options available for those coming to the activity. 5) Gymnitai nor any of its members are responsible for lost items, injures or other unforseen accident s that happens at the event site or location. 6) Gymnitai nor any of its members are responsible if attending participants decide to drink and drive and are involved in any accidents or police interdiction's after leaving the site. As such, plan ahead, have a designated driver or do not drink and drive at all if attending and you do not plan to stay the night. 7) Consider this much as you would any other Bar Citizen activity or event and plan accordingly. This just happens to last a bit longer. NOTE: The local police knows the event"s" are happening and when, they will be patrolling the areas, you have been warned! If planning to attend for only Saturday and leaving on same day / night / evening, then no reservations are required. If you plan to crash at the house over night reservations will be required even if for Saturday night only, even if not planning on attending Fridays Opening festivities at the house. Camping space is a First Come, First serve Basis. Usually on Sunday we will gather and go back to the event site for an early coffee and cake "They sell on site" before packing and heading back to our homes around noon Sunday. See FOOD ALLERGIES Below for what is planned for Fridays meal. 1) THIS IS A FAMILY FRIENDLY EVENT! As sad as I am to have to say this, but if you are totally bound to a wheel chair and can not handle stairs this would not be the event for you. Hopefully this will be changing in the future. The on site Toilet Facilities is handled by the motorcycle club and it has never been accessible to wheel chairs. The area is not paved to the event and camping site, there is a fairly even worn "Road / trail" to the back area location so it is accessible even with a wheel chair. But the uphill trek back would be a problem especially if it rains. The house is very old and IS NOT handicap friendly, 3 flights of stairs up to the party guest room area with 8 steps to each flight. I apologize for this but the house is not ours and I can not make changes to it. As I said before my greatest apologies for this, Hopefully this will change in the future when we build our house near by. Animals / pets are not suggested as this is an active farm and there WILL be large crowds at the Saturday activities. If only coming for Saturday pets would need to be on a leash at all times and you would need to insure they have a watering dish and food as well. Parking is a first come, first serve basis, there is no designated parking areas in the village, the later you arrive the further away you may have to park and walk to get to the site. Camping space is for mainly small dome tents and the space in the past has become very crowded as well. There is no running water nor showers on site, there will be porta-toilets so consider this as a "Primitive" camping experience. 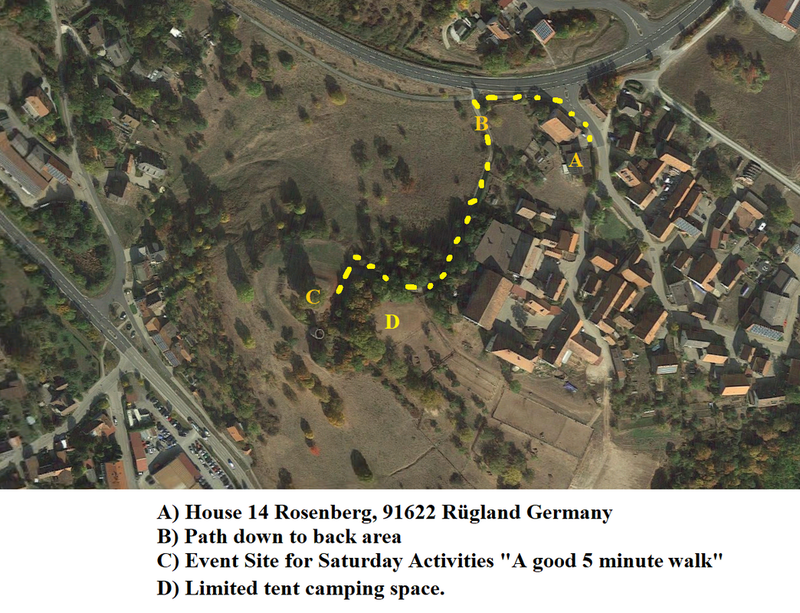 If camping and you get here too late you may have to hand carry your gear to the camping area which is a walk. or find there is no camping space left to set up a tent. If space is still available, We will do our best to assist and do make exceptions when it comes to off and on loading gear for designated handicap individuals. But the "TRAIL" is unpaved and small so even turning around to come back out once off loaded and the area is packed, can become an issue. Plan accordingly please. The party room will also double as the crash space or sleeping room. If you have problems sleeping around noise this may not be the location for you. Once I have 9 reservations for the indoor space it will close off or will end at the designated date listed above. This is CONFIRMED reservations, not a "I MAY have a friend coming" issue. I have 4 military style cots that can hold 1 person each, an extendable couch that can hold 2 and a LARGE bed in the room which has slept up to 4 adults but would then be crowded, so can sleep up to 9 people in close proximity. I suggest bringing your own sleeping bag or mats and covers. The event this year will again coincide with the annual local motorcycle rally, so there will also be live bands, a beer tent, grill food for sale and both a beer and hard liquor bar area on Saturday. If weather turns bad on Saturday then as done in the past, we will go back to the house and continue there with our own music and SciFi related movies and videos if the beer tent is overly crowded. Each year I have stitched event patches made, patches normally run about 20 Euro each at cost. If attending and you wish a patch you will need to pre-order them in advance by contacting me via email to arrange for payment via paypal. I make no profit off of the patches nor any of the event activities, Patches are at production cost. This is a totally none profit event. As such no refunds for ordered and prepaid patches. If something happens and you can not attend, I will mail them to you at postage cost. Those arriving Friday should have made reservations in advance "See above", so I will know how many to plan for food wise for the grill as usual. This is a BYOB style gathering, so bring enough drinks, chips and dips, deserts whatever for yourself and extras to share please. I will be providing "As is the tradition", the BBQ meats and a food related side dish or two as the main meal Friday evening. We will party and socialize at the house Friday and Friday night, sleep, then arise "umm well rested" and by 11 or so head to the motorcycle event in the back yard. There will be drinks, food and such for sale at the motorcycle rally on saturday, so have sufficient cash in hand, as we usually stay the evening there partaking in the activities and music, then make our way back to crash space or tents in the late night or early morning hours. IF the weather turns bad as has happened at times in the past, we would simply if the beer tent is too full, make our way back to the house and continue the festivities there with any remaining drinks, chips and dips that was brought for the weekend. As we get closer to the event date it will be best to check the local weather online for the area to see what is expected so you can dress and prepare for same properly. Those with reservations will be notified via email of changes or updates as needed. "You will need to bring sleeping bags or such, there is a Maximum capacity of around 9 adults for the upstairs room. A "First come, first serve basis", when it comes to reservations for indoor sleeping. Small dome style tents only as the camping area is usually packed by Saturday Noon. The current plan is grilled T-Bone steaks for the adults, Burgers and Hotdogs for the children with side dishes of Mashed potatoes and Coleslaw. This is not a catered thing, so I can not easily set up special dishes for vegetarians nor gluten free folks. I will do my best but no promises. 7) Number of Event Patches desired: (Pre-ordering and payment is required see above for info). 8) Contact email for confirmation and updates. 9) Phone number in case of sudden changes of venue if desired "Not required"